This is my attempt at being a copy cat. 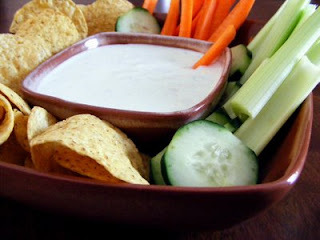 I ate the white dip at El Chico's in Muskogee, OK and loved it! I went to an El Chico's in Tulsa and found out you can only get the white dip in Muskogee, bummer. So I knew I had to come up with a copy cat recipe and here it is! Make this for your Super Bowl Party and you will not be disappointed. This is really good with veggies and tortilla chips. Mix blue cheese, sour cream, mayo, and butter milk until smooth, now is the time to add the garlic powder and kosher salt. Mix well and place in the fridge for a couple of hours. This makes quite a bit but it will not last if your family and friends are like mine! The only reason they have it there is to compete with Hamlin's El Toro restaurant - a long-standing tradition in Muskogee for Mexican food. The Hamlin's recipe was closely guarded for years. Reportedly, a misguided, disgruntled ex-employee of Hamlin's took the recipe to the El Chico's franchisee. I am not a El Chico's fan by any means. I am not into the "Tex Mex" craze, I just really liked the dip. When I have to eat "Tex Mex" I go for the soup. Will have to check out Hamlin's El Toro. Thanks for reading my blog. The next time you go into El Chico ask the wait staff for the recipe and they will give it to you. I’ve had mine for years and love it!! I love to cook and always have! I cook at least twice everyday from scratch I tell you!! I am a Taste of Home magazine Field Editor and love it!! Taste of Home is a great magazine for home cooks. The pictures you see here are not by professionals because I am not a professional anything. My husband Sean takes all of my pictures. Without him you would have a pictureless blog. I love to cook and that is the reason for this blog.